For a man who is one of the top billionaires in Dubai, Khalaf Al Habtoor should rest easy. He is one of the most respected businessmen in the United Arab Emirates, has become an international figure, and is self-made. His international conglomerate, the Al Habtoor Group, is involved in numerous sectors -- construction, real estate, automotive, hospitality, publishing and education. He has built a colossal empire that employs thousands. His latest venture includes building Al Habtoor City -- a multi-use development on the banks of the Dubai Water Canal, which will incorporate three luxury Starwood hotels: the St. Regis, the W Hotel, and the Westin. It will house a permanent Franco Dragone Entertainment Group production and three high-rise residential towers. This year, the Group opened the Waldorf-Astoria Dubai Palm Jumeirah on the iconic Palm Island. He should relax, but does not. There is work to do, and more importantly, peace to make. 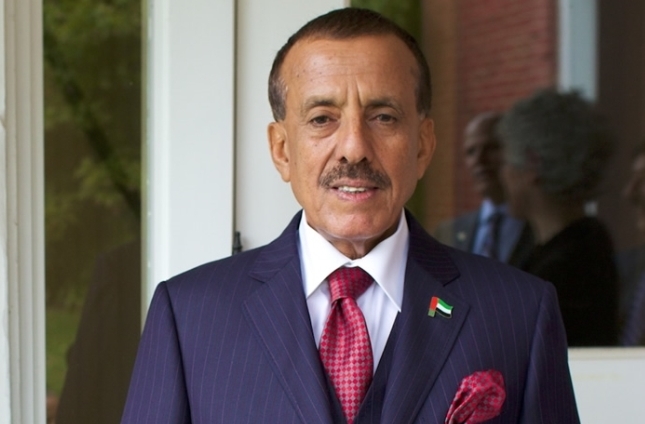 Al Habtoor is a businessman turned philanthropist who is widely seen as a global peacemaker. He constantly makes the rounds on the international policy circuit, frequently commenting on global issues. Yes, he is openly critical of U.S. policy, especially in the Middle East and is not afraid to speak about what he sees as the injustice of marginalized groups. He is widely considered the "unofficial ambassador" for the UAE. Fostering peace is one of the major activities of his recently launched foundation, which aims to bridge the East and West in terms of religious understanding. His schedule is a whirlwind. In the past month, he launched a peace initiative with former President Jimmy Carter at Illinois College, and gave the keynote speech in New York at the C3 Summit, where he was awarded the Lifetime Achievement Award, in recognition of his long-term contribution to regional peace and prosperity, as well as his bridge-building that has fostered understanding between East and West. He was also awarded the Global Humanitarian and Business Achievement Award by the National Council on U.S.-Arab relations in Washington, D.C.
On a recent visit to New York, Al Habtoor sat with Anna Shen, to discuss his views on global politics and peace. Can you tell me about your latest project with President Jimmy Carter? The initiative is called "Pathways to Peace," which is at the University of Illinois. It is aimed at tackling the Palestinian-Israeli conflict. The core of the initiative is a college seminar in which students will study historical examples of cultural, religious and ethnic conflicts, and the steps taken to resolve those problems. At the conclusion of the seminar, students and faculty will travel to the Middle East. The initiative is fully sponsored by my personal foundation, which launched two years ago. The Khalaf Ahmad Al Habtoor Foundation owns 20 percent of the Al Habtoor Group, so it is self-perpetuating. Its main purpose is to help whenever there is a crisis around the world, and to conduct research and educate. My goal is to bridge the gap between the east and west in terms of religion. I have shared my passion and concern for the Palestinian-Israeli conflict resolution with two great men that I admire: former U.S. President Jimmy Carter and former U.S. Congressman, the Honorable Paul Findley. I am proud to call Paul Findley my friend. Through my foundation, the Khalaf Ahmad Al Habtoor Foundation, I have supported The Carter Center for several years now and will continue to do so in their efforts towards resolving the Palestinian-Israeli conflict. The faculty and students involved will travel to Jordan and, if the security situation allows, to Palestine and Israel. They will meet with Palestinian and Israeli students and try to understand them and their needs firsthand. My hope is that they can achieve a realistic solution that could help the peace process move forward. I realize that the project might not be successful the first time, but we will try again and again. This is too important an issue for us not to try every possible way to see it happen. This initiative reflects the evolution of your concern for Palestine. Can you say more? Palestine has always been at the forefront of my thinking. We may be diverted from the Palestinian issue with other current matters only temporarily, but Palestine and the peace process are always in my mind and my heart. I am a realistic man and I set my goals with a real view. I will not dream and stick to the romantic idea that the Palestinians will return to Palestine, because there are different facts that have made this impossible and we have to live with them. Everyone hopes this issue is resolved sooner than later, but most probably, it will fall on the shoulders of our children. Their minds and way of thinking are different from ours. So, they should be asked to find scenarios and solutions to the conflict. They understand what their generation thinks and how they need to address this issue. What other issues do you think need to be addressed globally? Poverty. I am currently working on a proposal that I hope one day will materialize because its benefits will have a worldwide effect. For now, it is known as the Poverty Alleviation Proposal. The name is debatable, but for now, my concentration is on the concept. What I am proposing is a global system of revenue raising, or a global poverty tax. The idea is not novel, but the attempts before have not succeeded. My proposal is more ambitious. It requires governments to pledge an agreed percentage annually to a new independent body tasked solely with poverty-reduction. All the world's greatest faiths teach us to take care of the poor. Islam and Judaism require giving to the less fortunate. I invite everyone to read my proposal and give me input. Copies of the proposal are online on my personal website, www.khalafalhabtoor.net. You are passionate about Dubai's role in the world and want developed countries to look at UAE as an equal. Why? I pride myself on being an ambassador of my country to the world. I have always been conscious about the importance of bridging the East and the West, finding the similarities instead of the differences between different cultures. The world is very small, and we all have to share it. This is why we need to find the best way to coexist, to work together to make it a better place for everyone. I ask the U.S. and the first world countries to look at us at eye-level. We are grateful for everything you have done for us, and we have learned a lot from you. We have benefitted from your technology and your knowledge, but sometimes we have succeeded where you have failed. It is time you started looking at us as equals, listening to our advice, and recognizing our achievements. It is time the West realizes we don't need to be picked on for not following Western-style policies that quite frankly, don't seem to be working for the West that well either. You have always had our respect and our acceptance, but it is time you accepted us, respected our choices, and looked at us on the same level. We want to help, and we can help -- and given the chance this world will be a much better place for every one of us. Does that mean you think the world should look to the UAE for advice on regional issues? The West has made a lot of mistakes politically and militarily. If they consulted us, we could help. We at least know the soil and the color of the sand. We take advice from Washington, D.C. who don't always know (everything). I wish that sooner rather than later that the big powers could come and sit with us. Since you think that the world should look to UAE, there must be something that makes it different than other countries. What is it? Leadership. We are lucky with our leaders, our President and Vice-President. They are approachable, and are not working for themselves. They are working for the people and the residents of the country, especially security-wise. This is the most important thing that our rulers consider. We are a safe haven for the world. Also, keep in mind -- everyone else is pushed aside in other countries. But here, they feel happy and comfortable. People can feel safe because they have jobs and security and education. In fact, a lot of people in the West are coming to the UAE and to Dubai. Some are buying houses and retiring there -- Europeans, Asians, and people from all over the world. Many have said you and UAE have parallel lives. As your business empire has grown, so has the country. Can you expand on this? Yes, we have grown together. However, with development, our growth depends not only on the government, but also on the people. With the support of government, citizens and residents can ensure there is growth and economic improvement. This is why the UAE continues to be successful. There is transparency between us. There is great communication with the government and with the people. But we are all responsible not just the government. Maybe you should become a politician? I am not a politician. I say what I feel. I am a human being, and when I see something wrong I have to pinpoint it.